Max TV screens installed in condo elevators let residents use their time travelling from floor to floor to get caught up on all the condo's latest news, rules or events. The digital revolution has influenced condo living in a big way. Now residents can vacuum remotely while sitting poolside in Miami and turn on their lights while riding up the elevator. Max TV’s founder, Moshe Lokshin, is taking advantage of the digital mindset to bring condo dwellers news and entertainment value on their ride from the lobby to their unit (or vice versa). Lokshin spoke with me recently about the services Max TV offers. 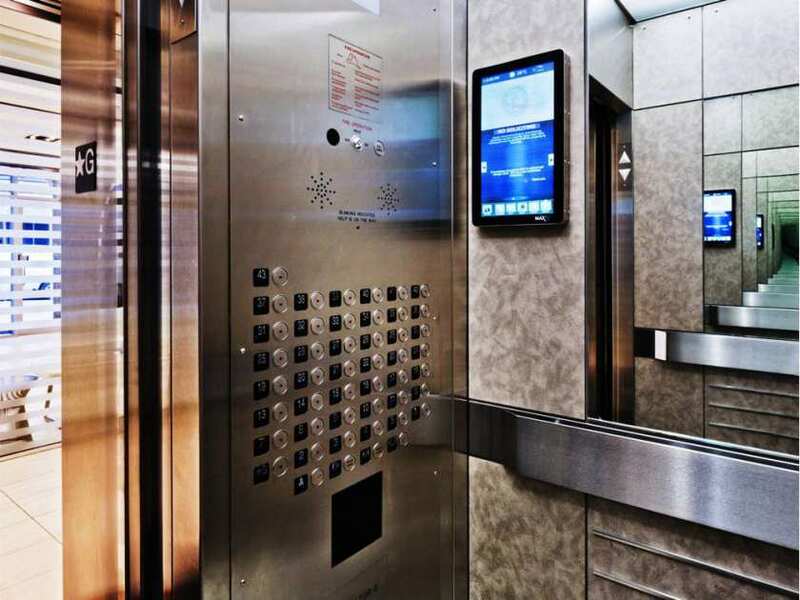 The system has both a hardware component — small interactive elevator screens — and a software component that allows residents to sign in and access a variety of condo community functions within a condo development. The touch screens, now found in condos across Ontario, allow residents to navigate through content customized by building management. News, sports, weather, building notices and classifieds are all possible tabs. Before this innovation, Lokshin points out, managers were printing notices and taping them on boards in elevators, mail rooms and lobbies. “We felt this was probably not the best way to do this,” said Lokshin, who used the tech craze to bring notifications to a screen near you. Popular uses of the screens include informing residents about community news, such as when a water shutoff or fire alarm test will occur in the building. Certainly it’s better to read about window washers arriving before they pop up outside your fifteenth floor window and scare you half to death. Another functional component for property managers includes the education side of condo life. Lokshin says many people move to condos having not lived in them before and therefore are unaware of facets of the lifestyle. For new condo residents the messages can be invaluable, educational and informative. While riding the elevator, questions are answered that new condo residents may think are too elementary to ask. Many buildings use Max TV to broadcast things like what not to put down the trash chutes (pizza boxes, for one) or to offer surveys to residents about the goings-on in the building. One notice advised that each condo owner should own a toilet plunger, while another advised not to start your dishwasher if you plan to go out. These messages are important to know; with the digital screens placed in the elevators, the messages get across. Long-time residents are happy that newer residents are easily introduced to their community’s protocol. Real estate is all about location, location, location and Lokshin tells me elevator placement is about location as it maximizes the exposure and time people have to access the displayed information. There have been lobby screens for some time, but it is not certain that residents will stop by the lobby to read the screens. Instead of standing still in the lobby, the elevator screens may be read while on the go. An elevator ride may be the only time during the day where your cell phone does not work, assuring your undivided attention. A trip down to your car on P2 becomes an educational experience. And those who prefer entertainment value while riding up or down might instead select the News or Sports tabs to find out the latest score of a Blue Jays game or about current affairs beyond the confines of their building. Max TV works with providers such as the CBC to bring up-to-the-moment news to their users. Management has the option to allow ads on their system or not; without ads, the systems cost less. Advertisements may be from anyone — from local businesses seeking “hyper-local access to the community” to restaurants, hair salons, dog walkers or banks. In addition to the touch screens, Max TV offers software that allows condo owners to log in and access a variety of back-end functions, such as booking amenities for the condo party room, guest suite, visitor parking or the move-in elevator. The software also lets the concierge record when packages arrive and flips the receiver an email to let them know what has been delivered (i.e. white box with a terrarium from Lauren and Heather). The screens I viewed in Toronto recently varied from building to building, but I loved the small screen discreetly placed at eye level in a beautiful mirrored elevator. The ride was short, but it was packed with great information and fun. With the explosion of digital communication, look for these informative screens in a condo near you.